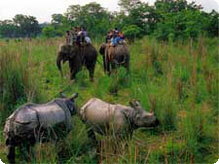 Jungle safari in Nepal is one of the amazing adventure trip in Nepal. Nepal offers you the chance to enter the jungle and view some of the rarest and most endangered wildlife on earth. Jungle Safari in Nepal can be a very amazing experience. It is possible for any visitor / travelers to stay in these parks and take part in an organized jungle safari and activity program. It’s a great way to relax after a trek and soak up the jungle environment, bring your kids along and have the family holiday of a life time A trip to Nepal is incomplete if you have not been on a jungle safari and wildlife adventure trip. While the mountains of the highest and most magnificent peaks in the world, the tropical jungles of the Terai preserve some of the best wildlife habitat in the subcontinent. Since jungle saferi / wildlife safari adventure trip has been open in Nepal for foreign trekker/Travelers, probably Himalaya Journey Treks and Expedition has depth experience in relevant matter for operate jungle safari tour in Nepal. The southern lowlands of Nepal are known as the Terai. This area is covered in dense tropical jungles and is home to thousands of bird and animal species, including some of the world's most exotic and endangered species. Due to increases in population, deforestation, and illegal poaching, the natural habitats of animals like One-Horned Rhino, Bengal Tiger, Snow Leopard, Red Panda, Blue Bull, and the Gharial Crocodile are being destroyed, and leading these creatures to extinction. This loss of Wildlife must be stopped so that future generations will have a healthy and balanced way of life. Fortunately, efforts are being made by the Nepalese government to preserve these natural wildlife sanctuaries and to maintain balance in the local Eco-systems. A number of conservation areas, national parks, wildlife reserves, and hunting reserves have been established in Nepal. Today, there are 16 national parks and wildlife reserves in Nepal, including the Chitwan National Park, world heritage site. Some of the national park of Nepal known as Chitwan National Park & Bardia National park are very popular for wildlife safari adventure in Nepal except that we have many more national park , wild life reserve and conservation area including the Langtang National Park , Sagarmatha (Everest) National Park , Dhorpatan Hunting Reserve , Mustang Conservation Area , Koshi Tappu Wildlife Reserve , Shey-Phoksundo National Park , Parsa Wildlife Reserve, Rara National Park , Khaptad (Baba) National Park , Shivapuri national park, Suklaphant Wildlife Reserve , Makalu-Barun National Park and Conservation Area , The Annapurna Conservation Area , Manasalu Conservation Area ,Kanchenjunga Conservation Area etc. There is many activities such as elephant ride, nature walk, canoe trip, bird watching trip, village tour & cultural performance can be enjoyed during the Jungle safari trip in Nepal.